MeowBit, now for XP as well as Windows 7 and 8. View Dot-Bit (Namecoin) domains system wide! | MeowBit! Whee! We now cover all common Windows versions: Windows 7, Windows 8, and XP. NOTE: THERE IS A SEPARATE INSTALL FOR XP. It is HERE. If you’re on Windows 7/8, you go HERE. The MeowBit for XP is a hard fork. We will do tech support for it on our forum, but will not be updating it as often as we update the Windows 7/8 version. We just did a lot of work making an XP version due to user requests. We’ve tested it and it works well on our end. Most people probably won’t need the update. If you’ve updated Windows XP in the last year, MeowBit should work fine out of the box. 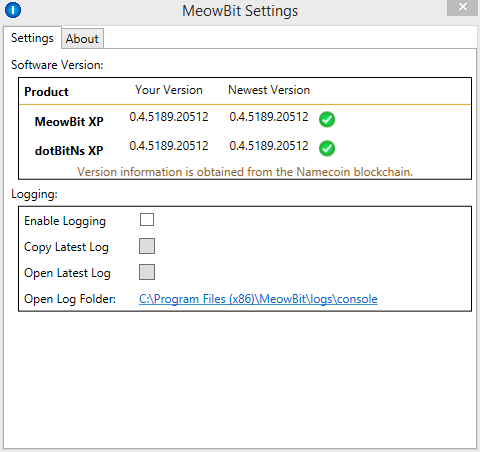 If MeowBit crashes shortly after start-up, it is because these updates are not installed on your system. contains the updates needed to run MeowBit on Windows XP. Source code for XP version is here.